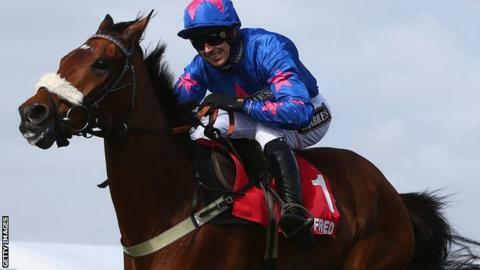 Cue Card earned some redemption for his fall in the Gold Cup as Paddy Brennan rode the 6-5 favourite to a convincing win in the Betfred Bowl at Aintree. Saddled by Colin Tizzard, the 10-year-old, who fell three from home at Cheltenham's big race in March, accelerated away from Don Poli and Djakadam to win by nine lengths. Cue Card has also won the Betfair Chase and King George VI Chase this season. In the next race, Annie Power streaked to victory in the Aintree Hurdle. The 4-9 favourite, ridden by Ruby Walsh, left My Tent Or Yours in her wake - just as she had in the Champion Hurdle at Cheltenham. There were two fatalities on the opening day of he meeting, with Clonbanan Lad and Marasonnien collapsing after being pulled up by their jockeys. On The Fringe, ridden by Jamie Codd in the absence of the suspended Nina Carberry, continued to dominate his division as he won the Fox Hunters' Chase. He has completed an Aintree-Cheltenham double for the second year in succession. That 'double-double' could become a 'treble-double' if he repeats his 2015 success at Punchestown later this month. The Kildare course could also witness a rematch between Cue Card and Gold Cup winner Don Cossack. "He has always been brilliant, but not has good as he has been this season," Cue Card's trainer, Tizzard, told Channel 4 Racing. Cue Card's career earnings now exceed £1m, while Annie Power has won 15 of 17 races during her career. Annie Power, trained by Willie Mullins, has also become the first horse since Istabraq in 1999 to complete the Cheltenham Hurdle-Aintree Hurdle double. "She is dynamite," said Walsh. "She is a wonderful mare, she was fantastic at Cheltenham and she was as good today if not better."